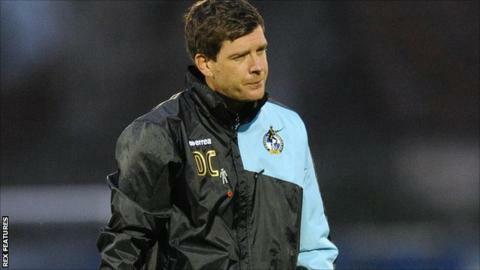 Bristol Rovers boss Darrell Clarke has admitted he faces a huge challenge lifting his side after their FA Cup defeat by non-league Chesham United. Rovers were dumped out of the competition after Sunday's 1-0 first-round loss at the Memorial Stadium. Ryan Blake's 77th-minute strike secured victory for the Southern League Premier Division side. "It's going to be one hell of a pick me up job," said Clarke. "Where did we go wrong? We missed a lot of chances." He told BBC Radio Bristol: "I'm thoroughly disappointed as all my supporters and players are, we've got to pick ourselves up off the floor. "To miss the amount of chances, you don't get your rewards if you don't put the ball in the back of the net. That's what cup football is all about - they go down, probably their only chance of the second half and score the goal, so we're thoroughly disappointed." Seventh-tier Chesham also missed a penalty and the manager of League Two Rovers admitted the performance was poor. "It's very low, I've got a set of lads who care, management and staff who care but it was not good enough," he said. "We have to be more clinical. We've got to dust ourselves down - it's a big test how we react. "For whatever reason at home we are missing far too many chances. I'm hurting, we just have to keep believing in what we are trying to do."